Figure 1.25. A close-up of the face of the same infant with the typical Potter facies associated with oligohydramnios and renal agenesis. Note the low-set abnormal ears, the flat nose, and micrognathia. Epicanthal folds were also present. Figure 1.26. Radiograph of the lower extremities of the same infant with sirenomelia shows the presence of two separate femora with fusion of soft tissue, two separate tibiae, and a single fibula distally. Skeletal deficiencies may be longitudinal defects which affect the limb on one side of the central axis or transverse defects in which the limb is truncated abruptly and the limb may terminate at any level but distal involvement is more common than proximal. Thus, radial aplasia with absence of the thumb and forefinger is characterized as a preaxial longitudinal hemimelia of the upper limb. Similarly, involvement of the lower limb would produce tibial aplasia. The affected limb will be curved toward the side of the deficiency and usually will be somewhat foreshortened. In transverse defects the defect closely resembles a congenital amputation but usually there is some degree of hypoplasia of the remaining proximal structures and the distal stump of the limb is not scarred but commonly small nubbins of tissue representing rudimentary digits may be present. Differentiation should be made between transverse defects, which are primary limb reduction defects, and secondary limb reduction defects which arise as a result of disruption. Figure 1.27. Amelia of all extremities (tetramelia). Amelia is absence of the entire limb structure. There was a history of consanguinity. Apart from the abnormalities of the extremities, this infant was normal. Figure 1.29. Close-up of the lower extremities of the same infant. Figure 1.31. Close-up of amelia of upper extremities of the same infant. This infant had abnormal scapulae. Figure 1.32. Close-up of ectromelia of the lower extremities of the same infant. Figure 1.33. 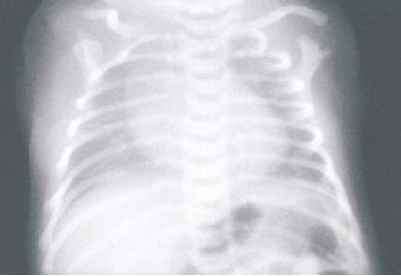 Chest radiograph of the same infant. Note the abnormal scapulae and total absence of the upper extremities. This radiograph stresses the importance of looking at the total radiograph and not the lungs alone when looking at a chest radiograph. of the same infant, note that there are no hip joints and that the femora and fibulae are absent bilaterally. Intercalary defects are those in which a more proximal portion of a limb fails to develop properly but distal structures are relatively intact. An extreme example is phocomelia, which involves partial or complete underdevelop-ment of the rhizomelic and mesomelic limb segments. The structures of the hands and feet may be reduced to a single digit or may appear relatively normal but arise directly from the trunk like the flippers of a seal. In less severe cases, portions of the proximal limb may remain. Figure 1.35. 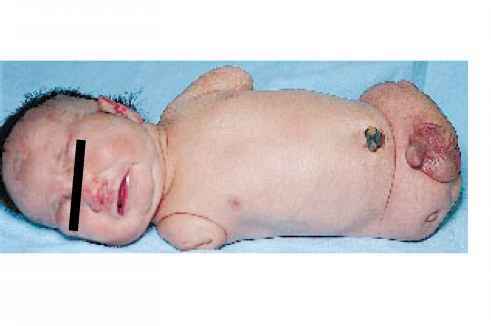 This otherwise normal infant has an isolated limb malformation of the left arm. This is a transverse defect and is a primary limb reduction defect. Figure 1.36. This infant represents an example of unilateral non-thalidomide-induced phocomelia. 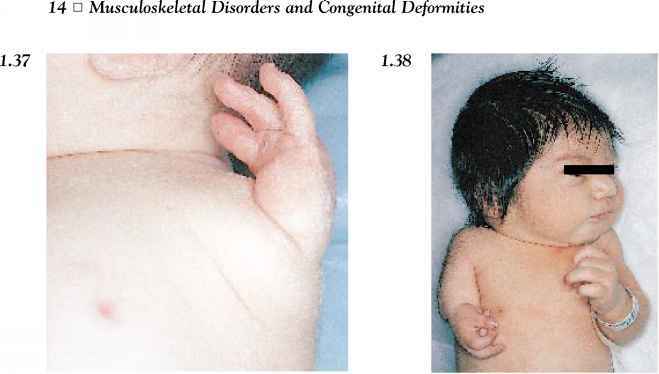 This malformation, which was common in thalidomide-exposed babies, is, otherwise, a very rare congenital malformation. Figure 1.38. Hemimelia of the right upper extremity. This is another example of a transverse defect in which a limb is truncated abruptly. This is a primary limb reduction defect. Figure 1.37. Close-up of the phocomelia in the same infant as in Figure 1.36. This is a primary limb reduction defect in that there was lack of the humerus, radius, and ulna in the left upper extremity. 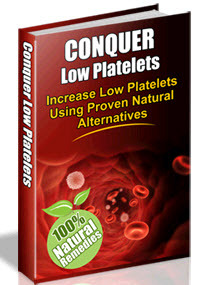 In phocomelia there may be absence of the femur, tibia, and fibula in the lower extremities. There may be bilateral involvement of die extremities. Figure 1.39. Close-up of hemimelia in same infant. Note the well-developed hand. Figure 1.40. This infant has the thrombocytopenia-absent radius (TAR) syndrome. There is absence of the radius bilaterally. Note diat the absence of the radius of the right forearm has resulted in a "club hand." In the TAR syndrome the thumb is always present. 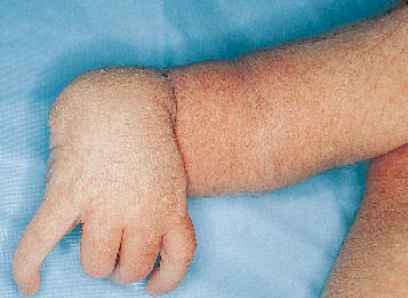 Clinical signs of radial dysplasia include a shortening of the forearm with radial displacement of the hand ("club hand"). Varying degrees of dysplasia occur, ranging from complete absence of the radius with major malformations of the preaxial (radial) side of the hand to normal development of the radius and only minor anomalies of the thumb. Figure 1.41. 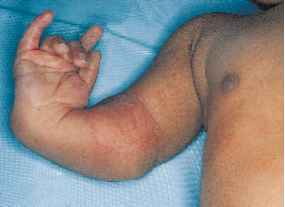 Another view of the same infant with the TAR syndrome showing the left forearm and hand. Again note the presence of the thumb. Some dysmorphic syndromes, such as the TAR syndrome, may show varying combinations of the different types of limb defect. There is a preaxial longitudinal defect (absence of the radius), but the ulna is also short and the thumb and forefinger are invariably present as expected with an intercalary defect. Radial dysplasia may be associated with pancytopenia as in Fanconi's syndrome but may also be associated with congenital heart disease and abnormalities of other parts of the skeleton. Figure 1.42. This infant has Fanconi's syndrome. Note the congenital absence of the right radius and right thumb. In Fanconi's syndrome the thumb may occasionally be present. Note the club hand with absence of the radius and the diumb. This may be unilateral or bilateral. In Fanconi's syndrome there is pancytopenia (anemia, neutropenia, and thrombocytopenia) in addition to the hypoplastic or absent thumbs and hypoplastic or absent radius. J ' Ai ^^Et . Figure 1.43. Another view of the same infant as in Figure 1.42 showing the absence of the radius and right thumb with the typical club hand. Figure 1.44. Another example of Fanconi's syndrome with congenital absence of the right radius and thumb and thrombocytopenia (platelet count of 30,000/mm3). Note the skin dimples at the elbow which are related to the infant's position in utero. Figure 1.45. Radiograph of the right upper extremity of the same infant showing the absence of the radius and right thumb. Figure 1.46. 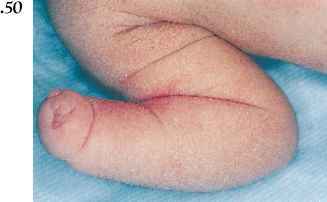 In this infant with Holt-Oram syndrome (cardiac limb syndrome), note the congenital absence of the left radius and thumb. The infant also had coarcta-tion of the aorta. Holt-Oram syndrome may be associated with any congenital cardiac defect of which atrial septal defect is the most common. 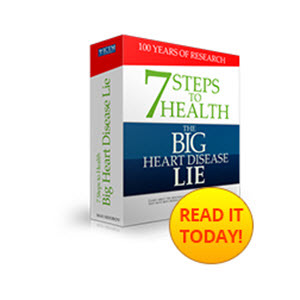 A family history of this condition is common. Figure 1.47. 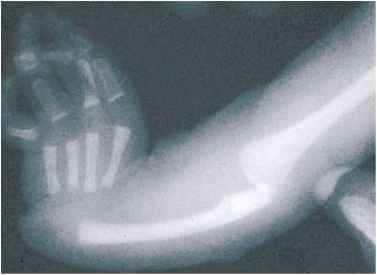 Bilateral congenital absence of thumbs and radii in an otherwise normal infant. The father of this infant had the same congenital abnormalities. It is important to obtain a good family history as this condition may be familial. Figure 1.48. 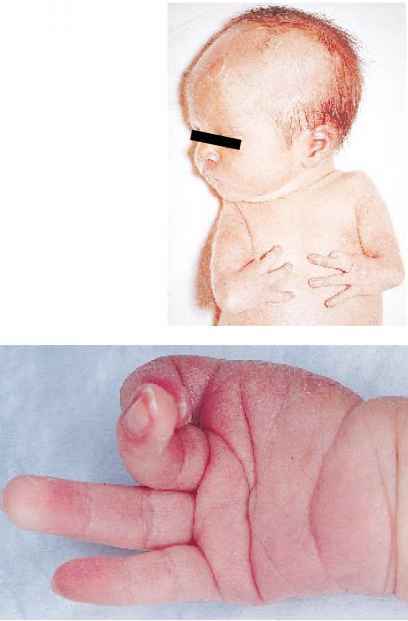 Congenital absence of the right thumb was present in this otherwise normal infant. Figure 1.49. 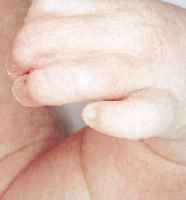 Another example of congenital absence of the thumb in an otherwise normal infant but note there is syndactyly between the third and fourth fingers. Figure 1.50. Acheiria of the right hand in an infant. This occurs because of a failure of formation of the hand as an isolated defect. The radius and ulna may be foreshortened, there are no metacarpals or phalanges seen radiologically, the thumb may be normally formed, and rudimentary nails may be present. This is an example of a transverse defect in which there is hypoplasia of all structures distal to a particular level on the limb. 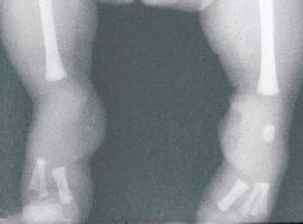 Usually there is preservation of the more proximal parts which may be normal or diminished in size. Figure 1.51. 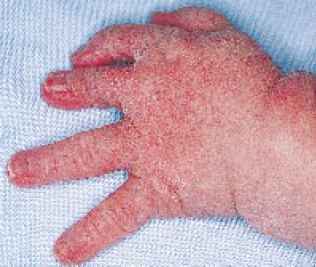 This otherwise normal infant had microcheiria of the left hand. Note the normal right hand. The normal hand is about twice as long as it is wide. If metacarpal hypoplasia is present it produces an unusually short palm. Figure 1.52. 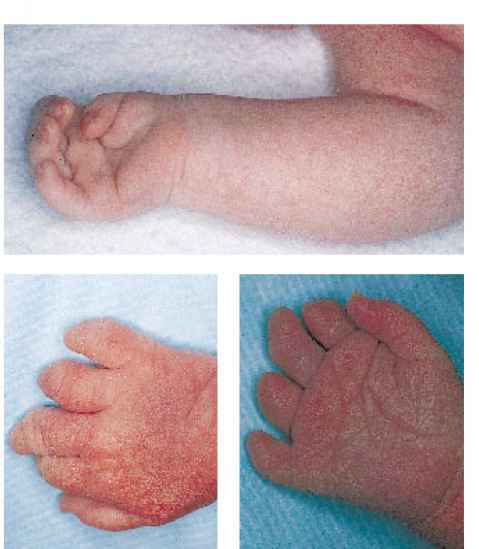 Note the microcheiria of the right hand in this infant with Cornelia de Lange's syndrome. This is not an uncommon finding in infants with this syndrome. Brachydactyly of the right hand. This finding may be isolated but is seen in many syndromes. Figure 1.54. Dorsal view of congenital brachydactyly of the index and middle fingers of left hand. The fadier had the identical type of congenital brachydactyly. 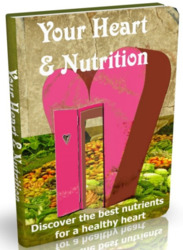 Asymmetric length of the fingers is usually the result of hypoplasia of one or more phalanges. Tapered fingers may indicate mild hypoplasia of die middle and distal phalanges. Figure 1.57. Camptodactyly (bent, contracted digits) most commonly affects the fifth, fourth and third digits in decreasing order of frequency. Presumably, it is the consequence of relative shortness in the length of the flexor tendons widi respect to growth of die hand. It may occur as an isolated finding but is more commonly associated widi lack of movement in utero. It is usually bilateral and symmetrical. Each finger should be extended passively to its full extent. Extension of less than 180 degrees at any joint signifies joint contracture (camptodactyly). Figure 1.56. Identical bilateral congenital brachydactyly in the infant's fadier. Figure 1.58. 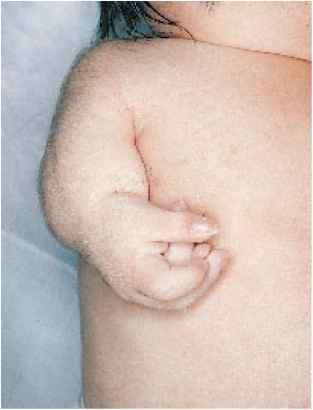 Camptodactyly of fingers in an infant with arthrogryposis. Figure 1.59. 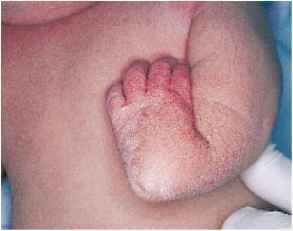 The hand of die same infant showing the severity of the contractures and lack of palmar creases due to the severe contractures. Note the depression in the palm resulting from the contracted fingers. Figure 1.60. Supernumerary digit in which die thin pedicle distinguishes it from true Polydactyly. In Polydactyly die additional digit may consist solely of soft tissue or less commonly has skeletal elements. Who gets the de lange syndrome? Is cornel de lange syndrome a musculoskeletal disorder?